Besides cheese and clogs, the Netherlands is also known for her colorful tulips. And the popularity of the flower goes way back: the tulip was already a hit in the Golden Age. It was so popular, that in 1636 and 1637 a true 'tulip mania' arose. 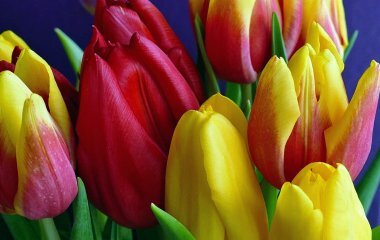 That's why we declare April to be the month of the tulip during our Golden Age-year! The Golden Age is literally blossoming in Delft! From March 28th till April 28th you can walk or cycle a special tulip route through the city centre. The concept is the idea of botanical philosopher Norbert Peeters and cultural entrepreneur Nina Voets. The route Flora Delfensis leads you through four courtyards and a few botanical places in Delft. You'll relive the 'tulip mania' from the 17th Century while enjoying the flourishing tulip beauty! During the route you'll discover all kinds of fun facts. For example, did you know that the Golden Age also used to be a 'Green Age'? Prosperity and trade paved next to gold also a way for new flora. Countless new plant species came to cities like Amsterdam, Haarlem, Leiden and Delft. This influx ensured the growth of plant lovers. Not even one plant is that symbolic for this botanical revolution like the tulip. From the 16th Century this flower conquered the hearts and especially the courts of the Dutch. 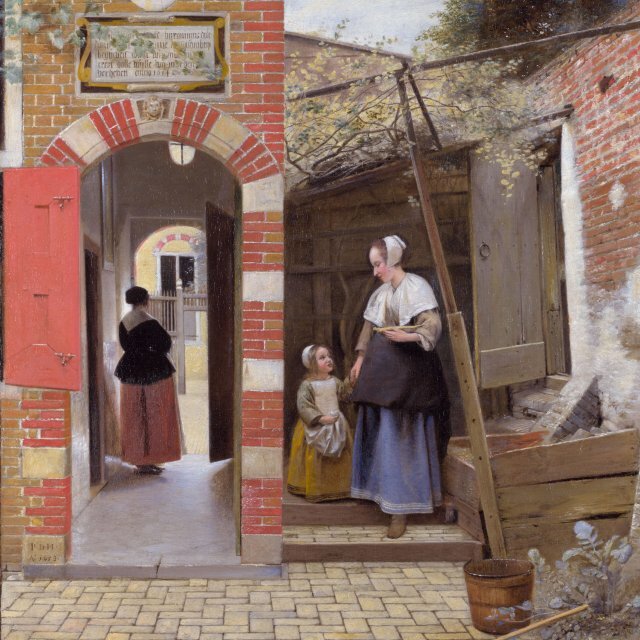 Flora Delfensis highlights the green history of Delft. For more information about the tulip route, the route book and fun tulip gifts you can visit the Tulipshop of Flora Delfensis from March 28th till April 28th. You'll find the store next to the Heilige Geestkerkhof 2 (across the Old Church). The shop is open from Thursday until Sunday from 10 a.m. until 4 p.m.
On Easter Monday Flora Delfensis is organizing a Tulip party on and around the Sint Agathaplein. A fun afternoon filled with musical performances, workshops about the tulip in the Golden Age and food and drinks with a wink to the profusion of the 17th century. In Royal Delft, the only original remaining Delft earthenware factory from the 17th entury, the most classic and iconic Delfts Blue is being made since the Golden Age. 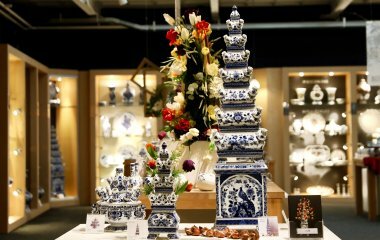 The exhibition 'Glorious Delft Blue' shows the grandeur of the Dutch Golden Age in all of its beauty. Admire amongst others the famous tulip pyramid where civilians in the superlative degree could boast their wealth. Don't forget to visit the stunning courtyard of Royal Delft! 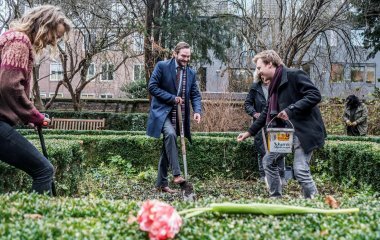 Bart Siemerink (director Keukenhof) and Henk Schouten (CEO Royal Delft) planted tulip bulbs, that reference the bulbs that Dirck Cluyt, the Delft court pharmacist of Willem van Oranje, were introduced. Soon the garden will be in full blossom: a color- and smell explosion guaranteed! The tulip vase also has a spot in the collection of Museum Prinsenhof Delft, including a set of flowerholders of pottery De Grieksche A. Only a few copies are known, probably because it were really valueable and labour-intensive objects to make. The quality does show what the Delfts potters could do. And not only the designers and shapers of the pots but also the painters and instigators of the oven. Top quality made with teamwork! In April it's time for the popular Tulip Harvestday! Last year this day attracted over 2.000 visitors. At the end of last year 90.000 tulips were planted that, to expectation, in a couple of weeks would flourish. 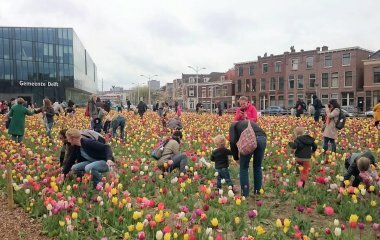 The temporary tulipfield has been landscaped by Stichting DelftBloeit. Stay on the lookout on the website for the date of the harvestday. The Delft Living Showroomday decorates the historical centre since 2009. This year the day takes place on Saturday April 6th and has a flower theme. 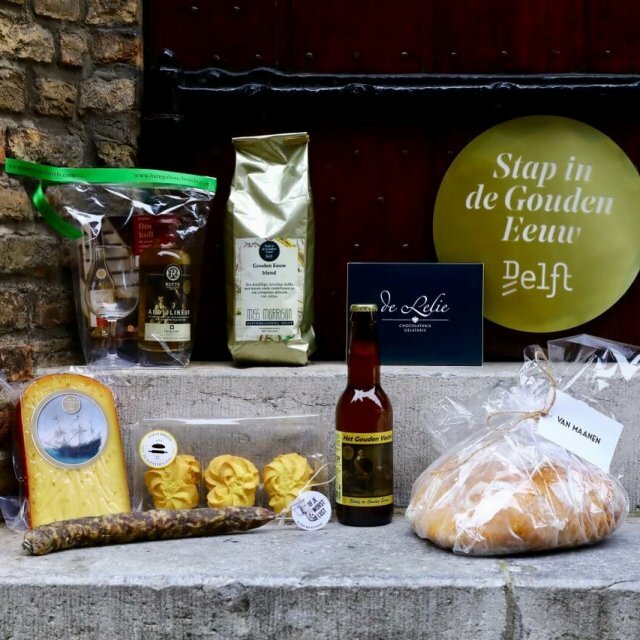 The greatest shops of Delft will put a smile on your face with the most beautiful 'golden' or 'flowered' living showrooms between 2 and 4 p.m..
Are you curious as to what's more to experience in the Golden Age-year? 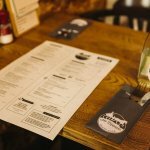 Have a look at our events calendar or follow us on Facebook.